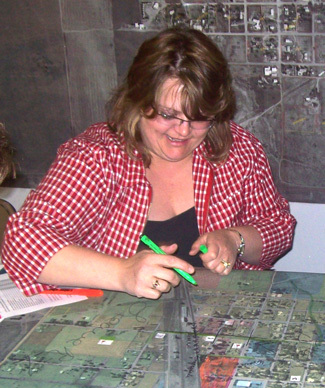 At a Special Meeting held at “high noon” on Saturday, December 18th, the Nunn Town Board, in a unanimous decision, approved a settlement agreement with Tori McMechan, the previous Town Clerk. You will remember McMechan was placed on administrative leave January 28th and subsequently removed from office at a hearing February 4th when eight of the eleven charges against McMechan were founded (see the Feburary, 2010 issue of The Nunnion for the charges). According to the Nunn Municipal Code the Board had no option but to remove McMechan from Office when the charges were founded (NMC 2.08.070 – Removal from Office – Decision, “…If four (4) members of the Board find the accused guilty of any of the charges, they shall resolve that the accused be removed from office, and his / her office is declared vacant.”). After being removed from office, McMechan filed suit in District Court against The Town of Nunn, the Board of Trustees, and Jenny Johnson individually. McMechan’s suit alleged eleven claims (see the April, 2010 issue of The Nunnion for a summary of the claims). In the end, the Settlement Agreement was not an admission of any wrong-doing on the part of the Town, it was simply a business decision that it would cost substantially less to settle than to take the suit to litigation and trial. At the December 18th Special Meeting four votes were taken pertaining to the “Approval of Settlement Agreement on Pending Litigation” Agenda item. The first vote was to ratify the agreement. The second vote was authorizing payment of the $1,000 deductible the Town must pay (the settlement is paid by the insurance company except for the deductible). The third vote was to approve Municipal Release of the Agreement. The fourth, and final vote, was to authorize signors for the agreement - Mayor Bender, Mayor Pro- Tem Norris, and Jenny Johnson. All four votes were approved unanimously. Under terms of the Agreement, disclosure relating to the terms of the agreement, including monetary consideration, are to remain confidential. However, due to Open Records Laws, a copy of the Agreement can be obtained from the Nunn Town Clerks Office by submitting a written (request). According to a document filed in U.S. District Court, the lawsuit filed by fired Town Clerk Tori McMechan against the Board of Trustees of the Town of Nunn and Jenny Johnson has been settled. The "Minute Entry for Settlement" was filed on December 7 and indicates that a five hour settlement conference was held on that date and that all claims in the action were settled. The parties are required to file a motion to dismiss on or before December 31. The filing does not include details of the settlement including any amounts to be paid to McMechan. The town board has set a special meeting for noon on Saturday, December 18 to vote on approval of the settlement agreement. Although the town's insurance company is expected to cover the bulk of any payment to McMechan, the town may have to pay an insurance deductible. NOTICE OF EXHIBITS REFERRED TO IN AMENDED COMPLAINT - TORI McMECHAN, Plaintiff, vs.
NUNN — A Nunn man died late Saturday in a one-vehicle crash shortly after he threatened several Nunn town board members with a knife, according to police. Weld County Undersheriff Margie Martinez said police were called about 9:45 p.m. to a the home in the 700 block of 4th Street in Nunn where there were several town board members. Martinez said the crash happened shortly thereafter. McMechan's son, who is a juvenile, left in a separate vehicle and was not involved in the crash. “We did recover the knife from the menacing at the traffic accident scene,” Martinez said. McMechan family spokeswoman Christy Alexander said she wasn't there Saturday night but McMechan's 16-year-old son may have been threatened before the incident with the board members. She said it's unclear whether Saturday's incident is related to a long-standing dispute in Nunn. Martinez said the case is still under investigation. The crash happened about 10:20 p.m. when James McMechan, 43, lost control of his black Chevy Silverado pickup. He was southbound on Weld County Road 36 as it approached the intersection of Weld County Road 96, Colorado State Patrol spokesman Sgt. John Hahn said. The truck hit a road caution sign at the intersection. McMechan, the only person in the pickup, was not wearing his seat belt and was ejected from the vehicle, Hahn said. Authorities are investigating whether alcohol or the speed of the vehicle played a role in the crash, Hahn said. Alexander, who has known the McMechans for about two years, said she will miss McMechan, who leaves behind five children. Alexander said she thinks that at the time he died, McMechan may have been going to work after shopping for groceries. McMechan was a directional driller for an oil company. McMechan, who is the husband of former Nunn town clerk and treasurer Tori McMechan, has had a confrontation with town board members before. In early August last year, board member Jenny Johnson said a car driven by James McMechan forced her car off the road as she was driving through town. A Nunn police officer ticketed McMechan with reckless driving. Tori McMechan told The Tribune in September that someone shot holes into her house a few years ago, and she believes it had something to do with her job. No arrests or tickets were issued in that incident. Tori McMechan was fired in February after a 41⁄2-hour public hearing. On Dec. 28, 2009, four new trustees and a new mayor were sworn in following a mass town board recall. Alexander, a former Nunn mayor pro-tem, was one of the trustees recalled. The dispute has unfolded in the shadow of disagreements about a proposed uranium mine near Nunn that have been ongoing for months but heated up last summer. McMechan has sued the town of Nunn and the town board in U.S. District Court in connection with that firing. James McMechan is the 17th person killed on Weld roads this year, compared with 24 at this time last year. 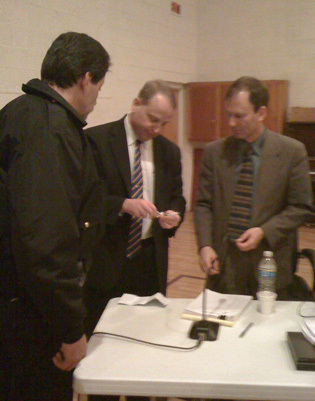 Mark Cohen, attorney for former Town Clerk Tori McMechan hands over town keys and a town credit card to Interim Nunn Town Attorney Greg Bell while Police Chief Mike Clement looks on. Financial and accounting data, meeting recordings, computer equipment, and files disappear from town clerk's office; McMechan withholds computer passwords; Board advised to not disturb "chain of evidence"
In a still unfolding story, town trustees have discovered that critical town files, electronic data, and equipment are missing from the office of Town Clerk Tori McMechan following the Board's action last Thursday to place McMechan on administrative leave pending a removal hearing. The hearing is scheduled for 6:00 PM tomorrow, February 4. Charges were delivered to McMechan on January 29. - A town computer is missing. - Another computer has been taken by the Weld County Sheriff. - They have been unable to get computer passwords from McMechan. - At least two years of accounting data seems to be missing. - Audio recordings of board meetings are missing. - Electronic files including board meeting minutes cannot be found. - Utility bills are delinquent. - Banking records cannot be found. - Email records are missing. - Budget records are missing. - A $2,273 legal bill was paid without board approval. - The 2010 budget was not submitted to the state by the January 31 deadline. - There are "ongoing investigations" by law enforcement. Trustees also found IRS penalty notices that the board was not told about. The trustees decided to have all exterior and interior locks in Town Hall re-keyed last Friday. According to Mayor Pro Tem Jenny Johnson, town government is operating under "emergency protocol" while trustees scramble to make payroll, keep the lights on, and put out water bills. The board cannot bring in a temporary administrative employee since the Weld County District Attorney is advising the board to not "break the chain of evidence." And caller ID has been added to the Town's phone system after trustees received multiple "nasty" phone calls from a McMechan supporter. At a Special Meeting tonight the Board voted unanimously to place the Town Clerk on administrative leave until a hearing for her removal from office that will be held on Thursday, February 4, 2010 at 6:00 p.m. at the Town Hall. Absent from this meeting was the Town Clerk. In attendance were the Interim Town Attorneys Greg Bell and Matthew Gould. Since the Town Clerk was absent the charges were not read and will be delivered to the Town Clerk by Nunn Police Department. Note: The trustees said the charges will be publicly released after being delivered to Ms. McMechan, and that her keys will be collected by the police. Prior to discussing the town clerk, Trustee Jenny Johnson made a forceful statement insisting that intimidation of town officials and residents should cease immediately, and that Nunn police will respond to reports of illegal intimidation. Apparently, a Nunn resident threatened a trustee before the meeting, warning that he would "get his shotgun" if the trustee voted to approve the removal hearing.